A Maryland lawmaker largely unknown outside of the region has become the focus of internet onslaught – and an accidental online celebrity – after he threatened a local newspaper because they wrote about him without permission. Kirby Delauter, a Republican council member elected to represent a southern part of the state inhabited with more than a half-million constituents, is now making headlines – and more than likely much to his chagrin – after vowing to do what the managing editor of a local paper called “pointless,” “misguided,” and “so ridiculously stupid” that he wasn’t sure how to respond. The latest drama surrounding the Frederick County, MD politician started over the weekend when Delauter complained on Facebook about a recent article in the local News-Post in which a journalist reported on the lawmaker without apparently asking permission. 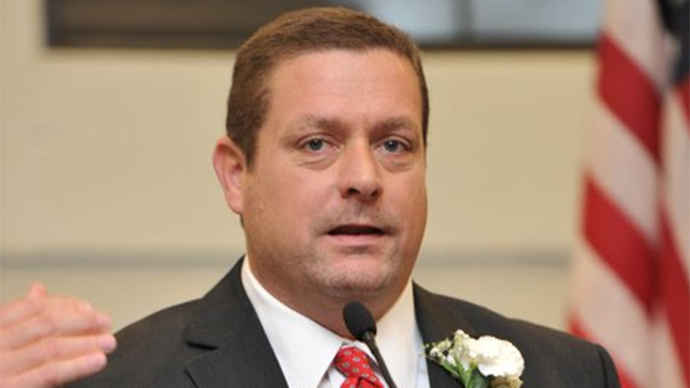 The News-Post editorial board wasn’t at a loss for words, however, and an op-ed published online by the paper on Tuesday – and the subsequent firestorm provoked by Delauter’s request – has propelled the councilman into the national spotlight. Tuesday’s editorial, titled 'Kirby Delauter, Kirby Delauter, Kirby Delauter,' evokes the councilman’s full name roughly 30 times, including in one instance achieved by way of an acrostic formed by taking the first letter from the nearly 1,000-word article’s satirical 13 paragraphs. “Uh, Council Member: In our country, newspapers are actually allowed to write about elected officials (and others) without their permission. It’s an avant-garde experiment, to be sure, but we’ve had some success with it,” legal blogger Eugene Volokh wrote for the Washington Post on Tuesday. In addition to the Post, the Chicago Sun-Times, NPR, BBC, and MSNBC quickly became the more wide-reaching outlets to run with stories this week on Delauter’s unusual war over words with the News-Post, and that added attention helped the District 5 representative achieve viral status on Tuesday when his name started trending across the United States on Twitter. Today is the day the Internet put its foot on Kirby Delauter's neck. “Today is the day the Internet put its foot on Kirby Delauter's neck,” DC-based journalist Jack Shafer tweeted on Tuesday.